One of the top rebel commanders in Syria has accused "hesitant" American and British policy-makers of effectively backing the Syrian regime of President Bashar al-Assad. Col Abdul Jabbar al-Okaidi said by accepting Assad's offer to scrap his chemical weapons, the United States gave him space to step up conventional attacks. "The West is supporting the criminal Assad regime," he told Tim Whewell in an interview for BBC Newsnight. It was his first foreign interview since stepping down this week as head of the Aleppo military council. The council forms part of the Free Syrian Army, which the West regards as the main moderate grouping on the rebel side. "When Mr. Obama says chemical weapons are a red line, that gives the green light to conventional weapons," the colonel told the BBC. "Ballistic missiles, Scud missiles, fighter jets like MIGs and Sukhois, helicopters, rocket launchers and tanks - all these can be used by the regime to kill Syrians. So the Western stance has been very negative towards the Syrian revolution." He described Britain's approach as "very hesitant." "They have not provided anything. They didn't stand with the revolution at all. "If you want to compare the British and French and American position towards [Libya's Moammar] Gaddafi and towards Assad, then the difference is enormous." "They made a quick decision there by removing the Gaddafi regime and providing help for the Libyan people to remove that dictator -- while here we are about to go into the third year and Britain and the whole world is standing by and watching." Col Okaidi, a former career officer in the Syrian army, was speaking in the Turkish city of Gaziantep, ahead of a two-day meeting of Syrian opposition politicians in Istanbul starting today. They will debate whether to attend the so-called "Geneva-2" peace conference. Western powers and Russia are pushing for the talks to go ahead. But Col Okaidi said he opposed the plan. "It will not succeed while the regime continues to kill people, bomb them from the air and direct artillery fire at them. "I don't think under such circumstances anybody can go into negotiations and peace talks with such a criminal regime," he said. 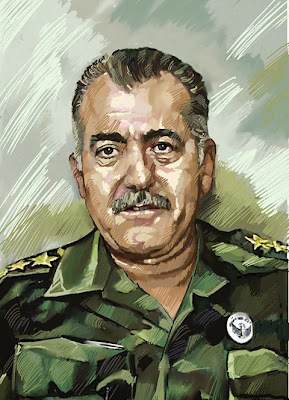 Col. Okaidi warned that the failure of the West to supply weapons to moderate rebel groups was strengthening the hand of the better-armed Islamists. He said: "In terms of weapons and ammunition we have not received anything at all. "Some communication kits -- that's all, and some ready meals from the U.S. I don't know how many because my fighters refused to eat them." Labels: Assad, BBC Newsnight, Britain, Col. Abdul Jabbar al-Okaidi, Free Syrian Army, Geneva-2, Obama, Russia, Syria, U.S.